The u-blox SARA-R410M module has now received certification on AT&T's LTE-M network to support a broad spectrum of IoT applications. It has now become one of the first cellular modules certified to support AT&T's LTE-M network. With a quad-band configuration (B2/B4/B5/B12), it is the only certified module capable of operating on both AT&T's US LTE-M network and their Mexico network, which is expected to launch by the end of 2017.
u-blox's SARA-R410M module will enable businesses to use the same hardware in both the United States and Mexico. This way, AT&T will be positioned to facilitate important use cases, such as cross-border tracking of vehicles and assets. Measuring only 16 x 26 mm, it is the world’s smallest quad-band LTE-M module available in market today, a distinction that enables designers to keep device sizes to a minimum. At the same time, it allows for form factor compatibility and easy technology transition from u-blox's existing 2G and 3G modules. Future firmware updates can also be supported over-the-air with u-blox’s uFOTA client/server solution that uses LWM2M, a light and compact protocol that is ideal for IoT applications. This ensures longevity of customer platforms for many years to come. 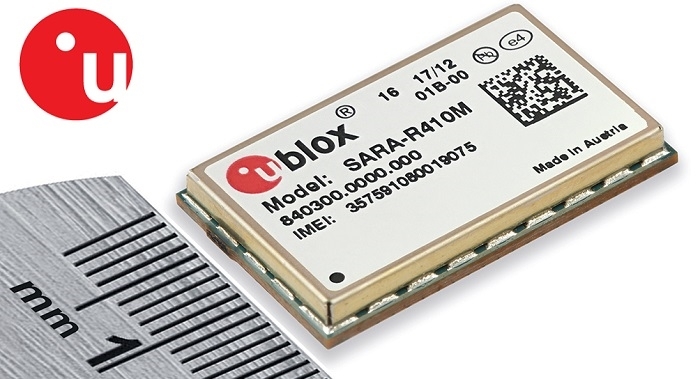 With IoT and M2M devices required to operate for long periods of time on a small battery, the u-blox SARA-R410M includes power-save mode (PSM) and extended discontinuous reception (eDRX) that together deliver battery life of up to 10 years. And with manufacturing in ISO/TS 16949-certified production sites and an extended operating temperature range of -40°C to +85°C, it is ideal for industrial applications.